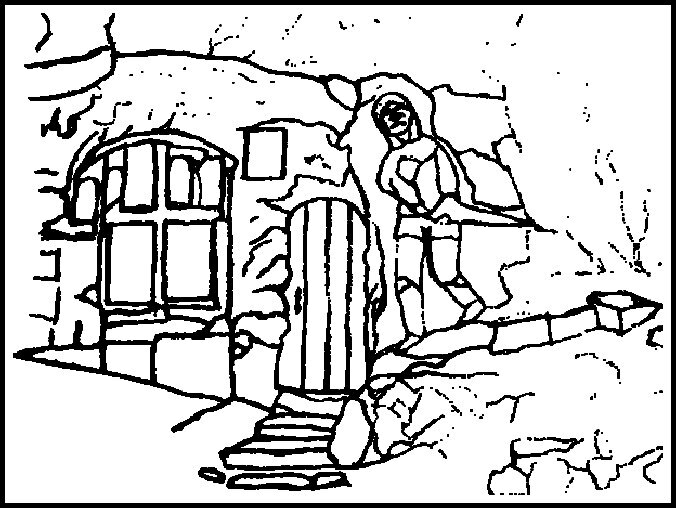 St Robert’s Cave by Storye book (Wikimedia Commons). OS Grid Reference: SE 36083 56059. 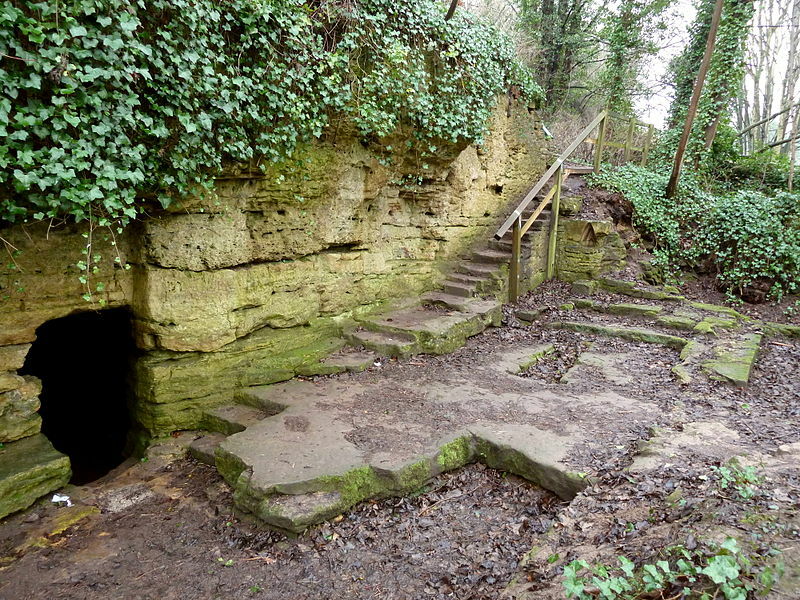 In a secluded wooded area near Grimbald Bridge between Abbey Road and the River Nidd at Knaresborough, North Yorkshire, is St Robert’s Cave & Holy Cross Chapel. Nearby, another chapel, but a 15th century wayside chapel and shrine, hewn out of the rock, which is today dedicated to Our Lady of The Crag. This particular chapel is not how-ever associated with St Robert. About 470m to the north is St Robert’s holy well, a healing spring resorted to by the faithful in times past. Robert Flower (1160-1218) was a hermit who spent many years here – more especially his latter years – but also at a number of other monastic sites across Yorkshire. He was said to have performed some miracles and devoted much of his time to the poor, though he was never canonised by the Church. You can reach St Robert’s Cave from the newer bridge on Wetherby Road (B 6164). Go down the steps onto Abbey Road and a bit further south beside the river is the cave. The medieval Chapel of ‘Our Lady of the Crag’ is ½ a mile to the west at the other end of Abbey Road. St Robert’s Well was located on Monkswell Park Road about a ¼ of a mile north of town. David Hugh Farmer (1982) says that St Robert was: “The son of an important townsman of York and became a cleric early in life. As a subdeacon he was a novice at the Cistercian abbey of Newminster, but stayed only a few months. He then chose to live as a herm at Knaresborough in a cave where another hermit, also in residence, was a knight in hiding from Richard I, on whose death (1199) he returned to his wife. Robert continued there for some years, until a wealthy widow offered him a cell and chapel at Rudfarlington, near by. A year later this hermitage was destroyed by bandits, so Robert lived at Spofforth under the church wall for a few months, then at Hedley near Tadcaster, where he found the monks to easy-going, before returning to Rudfarlington. Here he had four servants and kept livestock, but was soon in trouble with William de Stuteville, constable of Knaresborough Castle, for harbouring thieves and outlaws. The charge may have been true, for Robert was well known for charity to the destitute. 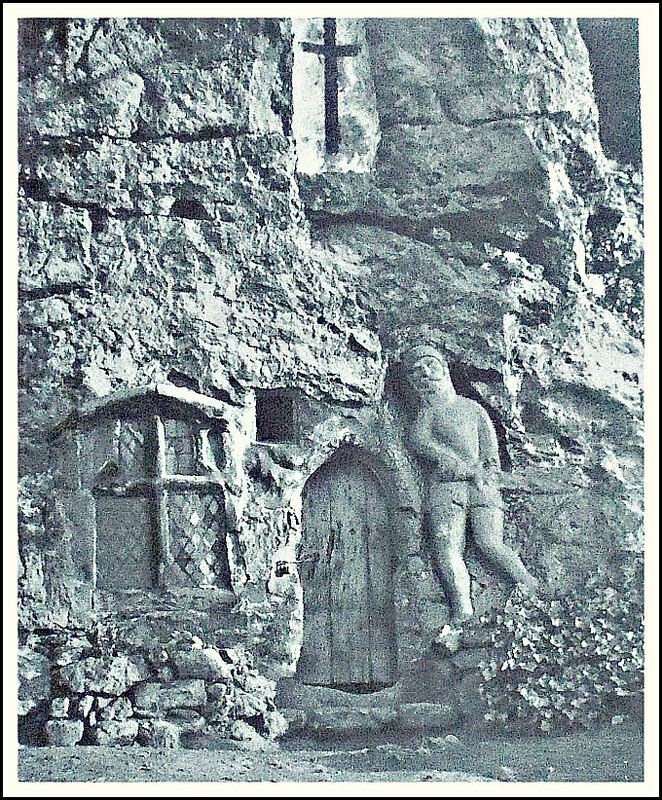 The hermitage was destroyed by William; Robert returned to his cave at Knaresborough, where he lived for the rest of his life. Farmer goes on to say of St Robert: “His benefactors included King John who gave him forty acres of land in 1216, which he eventually accepted for the poor and so refused to pay tithes on it. William de Stuteville also gave him land and cows. Robert had a companion called Yves, who remained with him for the rest of his life. St Robert’s Cave on Abbey Road, with its connecting chambers and the grotto-like inner chapel, were carved out of the solid Limestone cliff beside the river Nidd. It’s thought the saint himself enlarged the chapel and hermitage which has a stone altar, stone seat, two alcoves, medieval carved cross and more recent graffiti; building this structure must have taken a considerable amount of both energy and time. The chapel was dedicated in honour of the Holy Cross and maybe also St Giles? Pilgrims visited the hermit-saint knowing him to be a miracle worker, and even some eminent local people were known to seek his good council. However, the cave and chapel were frequently flooded by the river Nidd and for long periods remained uninhabited and cut off – this more so in recent times. After the death of St Robert in 1218 his body lay in a tomb that was located in the cave-chapel. There is a church dedicated to him at Knaresborough and another at Pannall, north Yorkshire. Morley church, Derby-shire, has some very nice stained-glass windows depicting the Life of St Robert of Knaresborough. His feast-day is 24th September. There used to be a holy well named for St Robert 470m to the north of the saint’s cave (at SE 3629 5650), but today that holy spot is the Monkswell Business Park, Manse Lane. However, the last vestiges of the said well/spring can still be seen although today it is a ‘wishing well’ into which locals throw coins! Robert Charles Hope (1893) said of this well that: “A short distance above Grimbald’s Bridge, in a field called Halykeld Sykes, on the north side of the river Nidd, is “”St Robert’s Well.”” There is also a chapel of St. Robert of Knaresborough, which was confirmed by charter to the Brethren of the Order of the Holy Trinity at Knaresborough by Richard, Earl of Cornwall.” Another holy well, said to be named after St Robert, can still be seen just to the southeast of Levisham, north Yorkshire. About ½ a mile to the west, at the other end of Abbey Road, is the medieval chapel of ‘Our-Lady-of-the Crag’, which has sometimes mistakenly been called St Robert’s Chapel, but this folly-like structure was built 200 years after the saint. The chapel, with its tiny inner shrine, was carved out of the sandstone rock-face in c1408 by a local mason by the name of John, whose son was almost killed in a rock fall. John prayed to Our Lady for a miracle. His son survived, and to thank Our Lady for the miracle he built the Chapel in thanks. The inside of the chapel is very tiny but there is an altar and a lovely modern statue of Mary. It has a carved vaulted ceiling with bosses and gargoyles. Church services do still occasionally take place at the chapel and groups of pilgrims come on visits (see the St Mary of Knaresborough website, below, for more informa-tion). By the chapel’s entrance and ‘standing guard’ is an 18th century carved statue of a very life-like knight in armour holding his sword. The chapel is Grade I Listed. Our Lady Of The Crag Chapel. Headley, Gwyn & Meulenkamp, Wim, Follies Grottoes And Garden Buildings, Aurum Press Ltd., London, 1999. 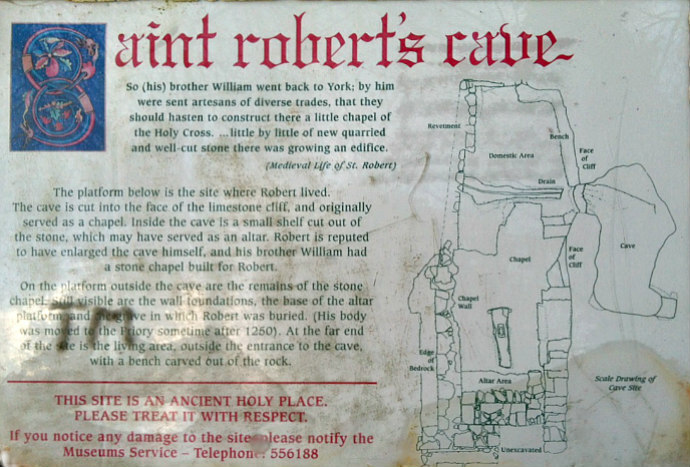 Categories: Ancient Churches & Chapels, Caves / Rock Shelters, Holy Well | Tags: St Robert's Cave/Chapel And Holy Well at Knaresborough in North Yorkshire | Permalink.